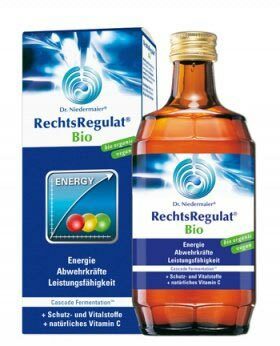 The Rechts-Regulat contains of pure natural raw materials. 14 natural ingredients are used for the creation of this product altogether. There are in particular: Onions, lemons, soy bean, saffron, cion, wal- and coconuts, dates, figs, peas, celery, millet and artichokes. Furthermore, spicery and lactose are being added. Moreover, this mixture is completed by dextrorotatory lactic acid. Rechts-Regulat is the outcome of a special fermentation method, the so called cascade fermentation. the book DIAGNOSIS: You'll Just Have to Live with It - No Thank You!